Carbon Dioxide (C02) Fire Extinguishers are designed to extinguish Class B and Class C fires and is available in portable and wheeled designs. Just like the Halotron I model, the Carbon Dioxide fire extinguisher is a clean agent extinguisher. The Carbon Dioxide pressured gas is residue-free and easy to clean-up. The C02 Carbon Dioxide fire extinguisher is designed to be used on sensitive electronical equipment as it is nonconductive and doesn’t destroy or corrode the equipment. These fire extinguishers are designed to extinguish the fire by displacing the oxygen in and around the fire. When used, small bits of dry ice may be discharged from the hose/horn of the fire extinguisher as a result of the extreme pressure within the fire extinguisher itself. CO2 extinguishers are commonly found in laboratories, computer rooms, home, and industrial kitchens, military buildings, warehouses, or any other private and public place where Class B and C fires are likely to occur because of its noncorrosive and earth-friendly properties. Class B fires are those that involve the burning of flammable liquids or gasses. Class B fires are common in industrial and home kitchens, auto shops, airports and other settings where gas, oil, grease and cooking oils are likely to catch fire. Note: NEVER THROW WATER ONTO A CLASS B FIRE as it may spread the fuel source and expand the area that is occurring fire damage. Other flammable liquids and gasses that are considered fuel for Class B fires include petroleum greases, oil-based paints, tars, alcohol, and some solvents. Class C fires are electrical fires. They can occur in electrical outlets and cords, appliances, electrical panel boxes, computers/server rooms, motors, tools, and any other source that may be energized or electrical. Note: By removing the power or energized electrical source, the fire is then no longer considered a Class C fire, but rather a Class A or Class B fire, depending on the fuel source that is still burning. Potable Carbon Dioxide fire extinguishers are designed mostly for offices, small computer/server rooms, single plane hangars, and other areas where sensitive electronical equipment or data is stored. To view all other Portable C02 Fire Extinguishers, please click HERE. Carbon Dioxide (C02) Wheeled fire extinguishers are designed for use on fires involving sensitive electronical equipment that is typically stored in larger buildings and warehouses such as research facilities, aircraft ramps and ports, electronic data storage rooms, military electronics, and vehicle/aircraft/marine service centers. 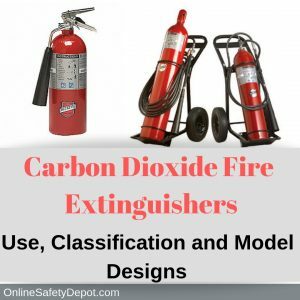 OnlineSafetyDepot.com also carries standard wheeled Carbon Dioxide fire extinguishers. All Carbon Dioxide (C02) fire extinguishers are UL and ULC listed and meet the DOT and Transport Canada requirements and standards. Additionally, all offshore fire extinguishers are USCG approved when used in conjunction with a certified marine bracket.